98% of repairs completed same day. Unmatched in terms of experience, quality of parts and quality of work. Customers are often referred to us after trying to save $10 – $15 and a repair has gone horribly wrong elsewhere. With PC Pitstop – you deal with the best in the industry – giving you more value with every dollar invested in your repair service. 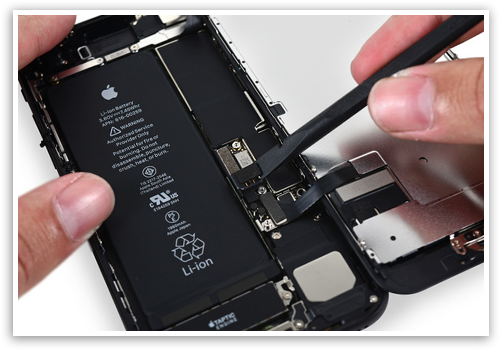 Backed by a full 12-month warranty, 98% of our iPhone repairs are completed the same day. We’re fast and affordable – that’s why we’re called PC Pitstop. Check out our Google reviews – we have thousands of happy customers. Call us. Your cracked screen doesn’t just look bad – those tiny shards of glass can get into your skin and are nearly impossible to remove. Leaving your iPhone with a cracked screen makes it susceptible to further damage and – in most cases – this leads to even more costly repairs. We fix and replace broken or cracked iPhones every day here at PC Pitstop. Drop into the store for a free over-the-counter consultation. If your iPhone touch screen is not responding like it used to, it could be a faulty digitiser screen or a software- or another component-related fault. The easy solution is to drop into the store for a free over-the-counter consultation. We’ll take a quick look at your iPhone, ask a few questions to see how it has been performing, then offer you the best possible solution. Drop into the store or give us a call. The camera on your iPhone is usually reliable, but faults can occur. We have a whole range of front-and-rear-facing cameras in stock for all popular models. 98% of all repairs are completed the same day. Your phone will be just like new. In and out like a pitstop – PC Pitstop. Drop in or give us a call. Your iPhone randomly turning off can be caused by a number of different faults. We’ve seen them all before and are confident we can help you. For the best possible outcome, turn your iPhone off then drop into the store as soon as possible. We’ll help you get your iPhone up and going again. Charging issues can arise from a range of possible software and hardware component faults. It could be something as straightforward as a charging port replacement. The team here at PC Pitstop know their stuff and have repaired 40,000+ devices over the years. We love giving the best possible service with the best possible parts at the best possible prices. That’s why we’ve won seven business awards and are consistently voted #1 in the Port Macquarie Hastings area. Drop in or give us a call. Battery replacements on your iPhone are straightforward. Your iPhone battery works hard 24/7 and lithium batteries can only be charged a certain number of times before they start to run out of power. You may notice your battery isn’t holding a charge like it used to, or your phone may not turn on at all. We’ve even seen batteries begin to expand and push out, or crack, the front screen! We’re here to help, with 98% of repairs completed the same day. Drop in or give us a call. Free over-the-counter consultations. Muffled sound, sound cutting out, loudspeakers not working, or no sound at all. The list goes on. If you have a problem with your sound or microphone, there’s a very good chance we’ve fixed it many times before. Drop into the store or give us a call. The team are here to help get your iPhone working again. The buttons on your iPhone get a lot of work and when they fail, it can be nearly impossible to operate your phone. We keep a wide range of iPhone parts for all popular models in stock. If there is a problem with your iPhone buttons, we have the solution. Drop in or give us a call. Stop. Turn your phone off, do not charge your phone, do not turn the phone back on. Following these steps will greatly increase the chances of a successful repair and give you access back to all your precious files. Get your iPhone to the team here at PC Pitstop as soon as you can. Putting your phone in rice isn’t going to do much, as only a tiny bit of moisture in the wrong area can cause big problems. We’ve repaired phones that have been dropped in toilets and mud, in the pool, in beer, covered in wine – you name it. Get your iPhone to us here at PC Pitstop as soon as you can. Following these tips will increase the likelihood of a successful iPhone repair. 20 Years in the business with 15,000+ happy customers, 7x Port Macquarie Business Award Winners, 100% Port Macquarie owned and operated. It’s easy to see why more people choose PC Pitstop with their precious iPhone repairs. Contact our team of experts. PC Pitstop accommodates everyone – from businesses to a family member who may have damaged their iPhone and everyone in between. If your iPhone is turned straight off and brought in for repair, your chances of a successful repair are even higher. PC Pitstop has the tools and parts to get the job done quickly. PC Pitstop can restore and recover data from iPhones. Restoring from your iCloud account or computer backups. In extreme cases, recovery from broken iPhones.